As 2007 came to a close and I had finished guiding for the year I turned my attention to some hunting of my own. I had picked up a Black Widow Longbow some 5 months earlier and had some success with it being Buff, Record Class Boar, Brumby & other smaller animals. I turned my attention to Chital (Axis) Deer one of my most favorite and frustrating animals to hunt. 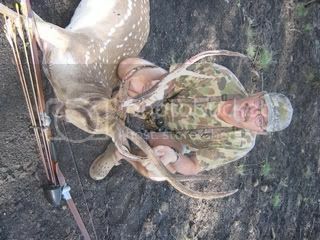 I had only taken 8 Chital over the past 10 years of hunting them with a recurve, they jump a lot more than I can hit. They are so fast and reaction times so quick they even make Compounds look slow. Anyway it was 1 week before x-mas and I headed out with my longtime hunting partner, Steve. We were going to put up some new tree Stands for the coming season and get some venison for the fridge. First afternoon I saw myself heading up the creek to a tree I knew I could sit in for the afternoon. I had no camo on just a pair of Crocs, Blue T/Shirt with a white stripe accross it and shorts. Plus my trusted Longbow with 2020 legacy arrows topped with razor sharp Woody's Outback widecut hunter broadheads. As I settled in I had a good view of some 30 deer feeding along the creek some 120 yards away, there amongst them were 2 Stags one well over the Aussie Record and one in the top 5. Well I thought this is good just keep coming. I sat there for the next hour and they eventualy fed away from me. I was about to head home when a doe caught my eye as she headed towards a basalt ridge to my right. I watched her and to my surprise she headed up the ridge and there in front of her was a nice stag in hard velvet having a sleep, I hadn't noticed him in the hour or so I was there. As she approached him he got up, turned around and lay back down again but this time looking out over the creek I was in. She continued past him looking for a fawn she had left in the long grass somewhere over the ridge. I gave her 10 mins to make sure she was gone and I slowly creep out of the tree and headed across the open ground to the base of the ridge. The stag had turned his head away this allowed me to make the ground quickly. Now the stalk was on, thinking to myself how are you going to get close enough to get a shot away with a longbow and no camo. I slowly creep up the ridge using a fallen tree as cover and the rocks to keep the noise to nothing (I had slipped off my crocs by this stage). I made it to 15 yards and peered through the branches there he was totally oblivious to my presence. What now do I wait until he stands up and offers me a shot or do I get closer. Having been in this situation many times before only to have a stag get up and walk off in one motion I was up to risk of getting closer. I was at one end of the fallen tree and a gap of some 2 feet was going to be a problem as the Stag could see any movement if I was to get to the other end where he was. He tucked his head into his side that was my chance I made a 5 yars along the tree in less than 2 hops, rock to rock. was he still there as I could no longer see him. My heart was racing as I moved along the cover of the tree, at the end I peered around the corner he was looking around again, I ducked back behind cover and gave him a minute. I slowly peered around again he had his head tucked away again. I stepped another couple of yards, position was now perfect or as perfect as it was ever going to be. I was now right behind the root ball of the tree and the Stag was 6 yards on the other side, I slowly drew the bow and moved out to have a clear view of his chest area, his head was still turned away. As the arrow left the bow I knew the shot was perfect but was he still going to be there when the arrow arrived....he was....the arrow penetrated some 10 inches into the boiler room, the Stag never moved he swung his head to look at me and the second arrow slid under his chest into the dirt. I could see the bewilderment in his eyes, the 3rd arrow exploded into the root ball in front of me as it clipped a root sticking out. He lept to his feet and went like a rocket into a stand of trees some 150 yds away. I stood there wandering what had just happened I had 3 shots not even remembering the last 2, it happened so quickly. Adrenalin is a magic thing. Back to reality, I picked up the arrow that had done all the damage good thick red blood was on the arrow, not a heart or lung but most probably a liver shot, must have clipped his front leg on the way through. I could still see him in the trees and he lay down, I moved in to approx 30 yards he was laying on his side as if dead but I could still see his chest moving it's not over yet. As I got to 10 yards in the cover of a tree he looked up to see were that crunching sound was coming from, I stopped his head turned away again, I ran to 4 yards and slipped a arrow behind his rib cage and into the boiler room. he sprang to his feet and ran 80 more yards before going down. He just lay there staring back in my direction. As he took his last breath, relief came over me I had taken a Chital with a Longbow something I thought would take me a very long time. The 3rd morning I was up a newly constructed tree stand and low and behold a stag trotted past at 25 yards. As the arrow left the bow I thought you have to be joking a trotting Stag, 25 yards.....bingo... the arrow entered just above the brisket and into the heart. He ran 150 yards in a semicircle and died 50 yards behind me. What a x-mas present and what a year. Stag will be NO.8 in the Australian Bowhunting Association standings at present. Photo taken the following morning. Good hunting to all from Oz. Mate a brumby is a Aussie Wild Horse.